MG is a British made sports car manufacturer best known for its 2-seater open sports car. Each of our MG convertible tops is manufactured to original pattern specifications and we offer the original fabric selection. Our MG convertible tops will instantly renew your vehicle to show room condition. 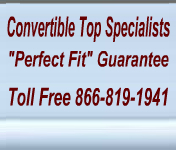 Our replacement MG convertible tops are available for the MG TD convertible top, MG TC convertible top, MG TF convertible top, MGA convertible top, MGB convertible top and MG Midget convertible top.